Entertaining doesn’t have to always be a five course, home-cooked meal. Sometimes busy schedules call for easy entertaining. Plus, with all the cooking we do this time of year for Rosh Hashanah and Yom Kippur, by the time we get to Sukkot we’re totally cooked-out! 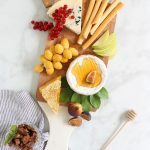 That’s why I created the easiest fall appetizer board to help you with your entertaining. It’s comprised of mainly store bought ingredients so you don’t have to spend too much time in the kitchen. Simply buy your favorite snacks, dips, and appetizers from the store and pile them together! It seriously takes such little effort and is ridiculously quick. The only recipe on this board is for lachmagine. Lachmagine are little meat pizzas with wonderful and comforting flavors like tamarind and allspice. My family traditionally serves them on special holidays and they are always gobbled up! An appetizer board is also particularly great for Sukkot because they are relatively easy to transport. If you are transporting it from the kitchen to your sukkah, remember to use a board with tall edges. So much easier than bringing out hot soup! Or to make it even easier, you can set it up directly in your sukkah right before your guests arrive. Cover it with plastic wrap until you’re all ready to eat. In case that’s not enough of a reason to make it, it’s also STUNNING! I love when something so easy and quick to make is a total showstopper. It has such big impact and will surely get your meal off to a great start! Best of all?? It’s SO. MUCH. FUN. Guests love snacking on olives, crackers and dip, and hors d’oeuvres. It creates engaging conversation and a wonderfully relaxed atmosphere. Serving Board: You can use anything you already own. A large wooden cutting board (or 2 placed side-by-side), 2 rectangular platters or a large tray. Our table is very long so a rectangular board works well, but use whatever works best for your table. Snacks: You can use anything you love munching on. I used olives, nuts, crackers, dips, fruit, veggies, dried meat, honeycomb and lachmagine. I always have lots of fresh challah bread on the table as well. Small Bowls and Spoons: For dips and spreads. Seriously the easiest fall appetizer board! Am I right??? I also included fresh flowers! The easiest and prettiest party decor! Serve some red wine and a delicious fall sangria too. Everyone always loves my Sangria with 3 Special Ingredients! Recipe for the lachmagine HERE! I love this. I’ve thought of doing this so many times. Thank you for the inspiration.